You’re looking for a high-intensity workout, but don’t want the mundane routine of a traditional gym. Or maybe you’re an aspiring mixed martial artist looking for world-class training to prepare you for the octagon. From personal fitness to learning self-defense to training to fight at a competitive level, there are innumerable reasons why students choose to enroll in the Muay Thai program at the Academy of Combat Arts. If you’re interested in learning this increasingly popular and highly rewarding sport, then you’ve come to the right place. Why Train at the ACA? 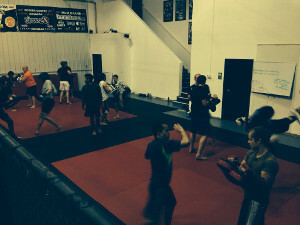 The Muay Thai program at the Academy of Combat Arts is run by the most experienced trainers in Fargo-Moorhead. Our gym also provides a welcoming atmosphere where everyone is treated like family. We cultivate a culture that is free from egos and intimidation where beginners and advanced members alike can enjoy developing their Muay Thai skills. With the most effective Muay Thai training program in the Fargo-Moorhead area taught by experienced instructors Joe Trottier and Jason Natal, you’ll get in better shape more quickly than with most traditional workout programs, all while learning incredible self-defense skills. No Egos. No Intimidation. Just Expert Training. When you first arrive at the Academy of Combat Arts, one of our instructors will walk you through an introductory lesson where you’ll be shown around our gym, and shown some rudimentary techniques. From there, you’ll develop your skills alongside other students such as yourself, with emphasis on learning the basics until you’re prepared to advance. We cultivate an ego-free culture to ensure that your experience will be positive, supportive, and free from intimidation. If you think you’re interested in training in Muay Thai at the best martial arts gym in Fargo-Moorhead, but you’re not sure if you’re ready to commit, then sign up for a free 30-day trial to see if our program is right for you. If you decide you’d like to stick with it, we offer both six and 12 month contracts. If not, then no worries; you’ll be under no financial obligation, and we’ll always be here if you change your mind later. Burn calories. Defend yourself. Achieve greatness. Contact us to sign up for a 30-day free trial and learn Muay Thai at The Academy of Combat Arts. Get 30 days of free Muay Thai training from the best instructors in the Fargo-Moorhead area.